As a child, Fernando Alonso was a driving prodigy. At the tender age of three, his father recognized his son’s passion for racing and by the time he was seven years old, Alonso was dominating the local junior kart leagues. By age 12 Alonso had the support of IAME, a leading kart engine producer. In 1994 he won the Junior Spanish Championship and in 1996 he became the World Junior Karting champion. Alonso graduated to F1 in 2001 and in 2005 he became the youngest person to win the Formula One World Drivers’ Championship at age 24. Alonso’s achievements are a result of his passion and commitment to his craft. 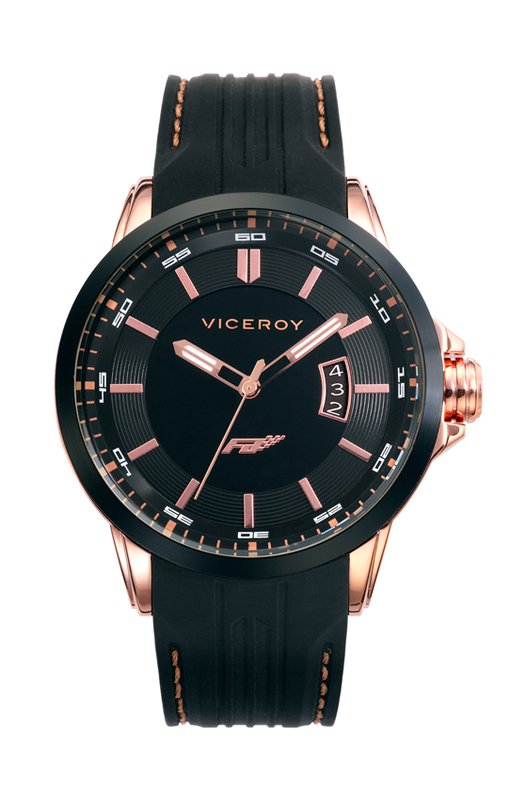 The Fernando Alonso watch collection by Viceroy contains watches designed to embody these traits of Alonso’s life to date – inspired, youthful and successful – and one example is the model with reference number 47821-97, a watch that exudes the triumphant spirit associated with Alonso. Like other watches in the current collection, the design is fresh and energetic, with a sizeable 46 mm case made of stainless steel. This version is coated with rose gold IP and, unlike the many chronographs in the collection, is three-handed; the simplicity and color give it a look that is poised and distinguished. In keeping with the current collection, the bezel is made of aluminum and the caseback is solid stainless steel. Mineral crystal protects the watch from the front and contributes to 164 feet of water resistance, which helps protect the dependable quartz movement inside. 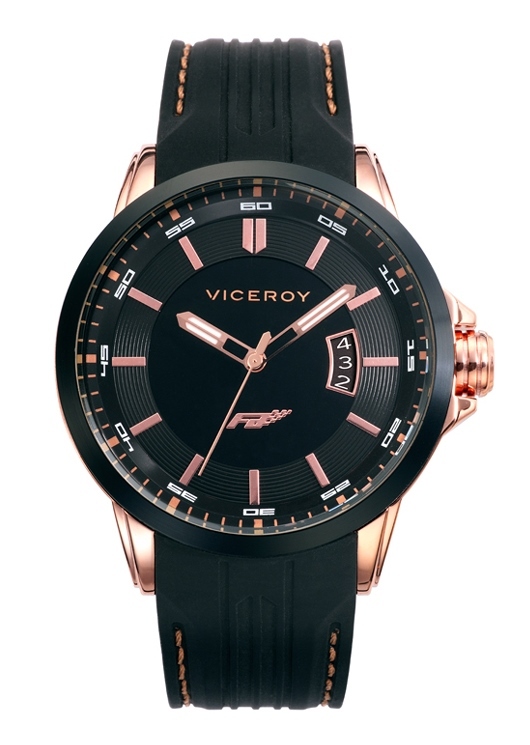 The combination of rose gold and black on a sport watch of this size is exceptionally masculine, and aside from some choice white accents on the dial, the smart color scheme is maintained from top to bottom. On the dial, a solid black central base is surrounded by embossed concentric rings, over which rose gold IP hour markers are applied. The hands are also rose gold IP along with the date window frame and the Fernando Alonso checkered flag logo. The numbers on the date wheel, as well as the minute markers at each hour index are printed in white and contrast well; the white also unites the snowy appearance of the luminous coating on the hour and minute hands. A fitted black silicone strap continues the color scheme with its bronze-tinted stitching that matches well with rose gold. The steel prong buckle is also coated with rose gold IP. A circular band motif, represented on the dial by the aforementioned concentric rings, also extends to other parts of the watch. A profile view of the bezel reveals a three-tiered ring; the same look continues on the crown as well as the strap, which has embossed rings through its center. Watches in the Fernando Alonso collection urge you to persevere, to be independent, and to grab hold of the wheel and steer your own course. Get ahead while wearing a watch that represents your attitude and desire to succeed. Try the sophisticated 47821-97 for your life off the track. Contact an authorized Viceroy dealer today.